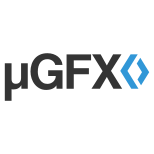 This is the actual µGFX library - the real deal! Added GFX_COMPAT_V2 to maintain source compatibility with V2.x programs. It is turned on by default. Added GFX_COMPAT_OLDCOLORS to allow V2.x Red, Green, Blue color names. It is turned on by default. Added GFXON/GFXOFF to replace V2.x TRUE/FALSE for configuration options. Added gI64 and gU64 when the compiler supports it. GFX_TYPE_64 macro is defined as GFXON if it does. Fixed headers to ensure size_t, NULL are always defined. size_t is not used as it may be 64bit. Right now I'm trying to understand and evaluate the software. Thanks to all those who are developing and making available to the community for free. This library is state-of-the-art software provinding an easy and fast way to integrate graphic displays to your project. It also provides additional drivers for touchscreens devices. Audio input/output modules are included too. Support is great, through community forum and IRC channel. It's free to use for home and hobby applications and commercial licenses have a great price. uGFX supports the more popular boards, display drivers and operational systems or just bare metal applications. I would recommend this to anyone who needs a high modular and lightweight solution. Thanks to all the community for provide this for free. Starting to migrate from v2.8. Thanks a lot. Best regards.